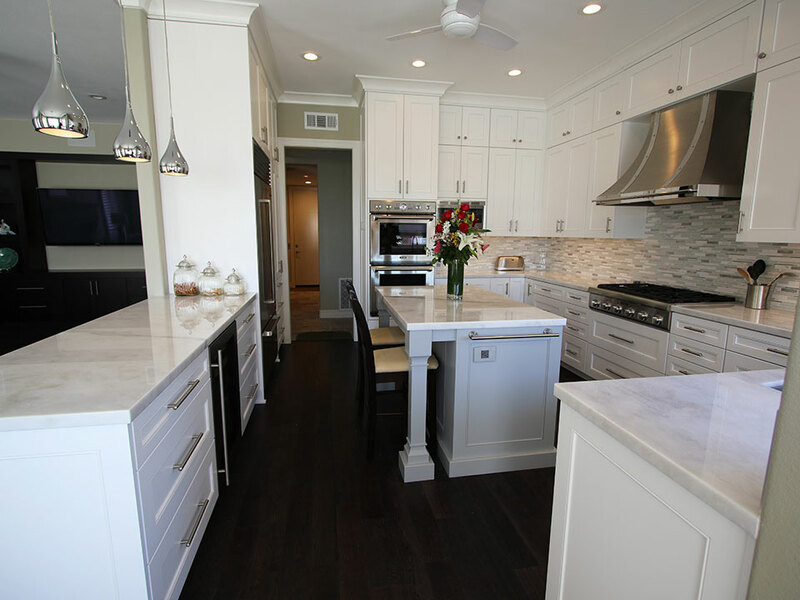 Before the start of this complete kitchen and living area remodel, the owners of this Laguna Niguel home found themselves with a kitchen that was not only outdated but also cramped, closed-in and with an awkward, inefficient layout. 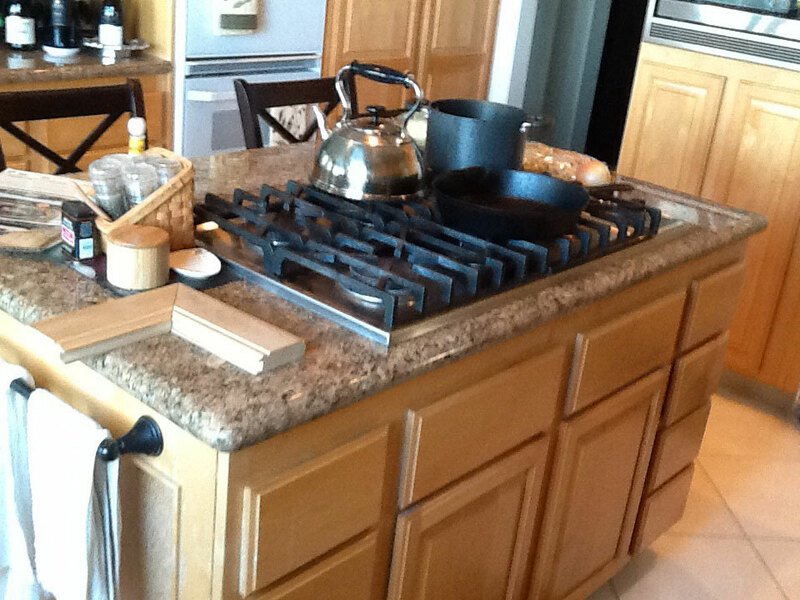 The centrally-located kitchen island was small, leaving very little room for eating, let alone cooking or prep work. 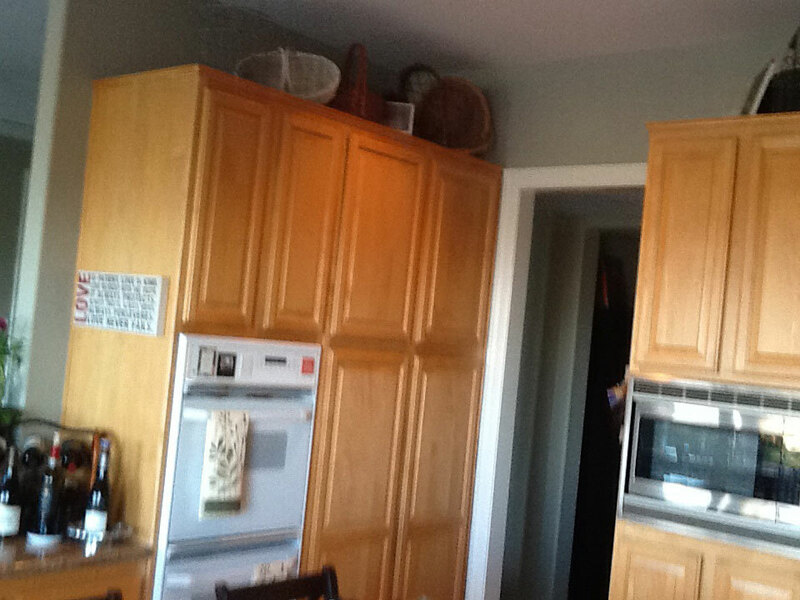 The honey-colored cabinetry wasn’t updated, and there was a lot of unused space—in particular from the top of the cabinets to the ceiling. There was also a pony wall feature separating the living room and the kitchen, which continued on to become a full wall. There wasn’t a sense of flow present between the kitchen and living area, nor was there anything modern or distinctive about the design. 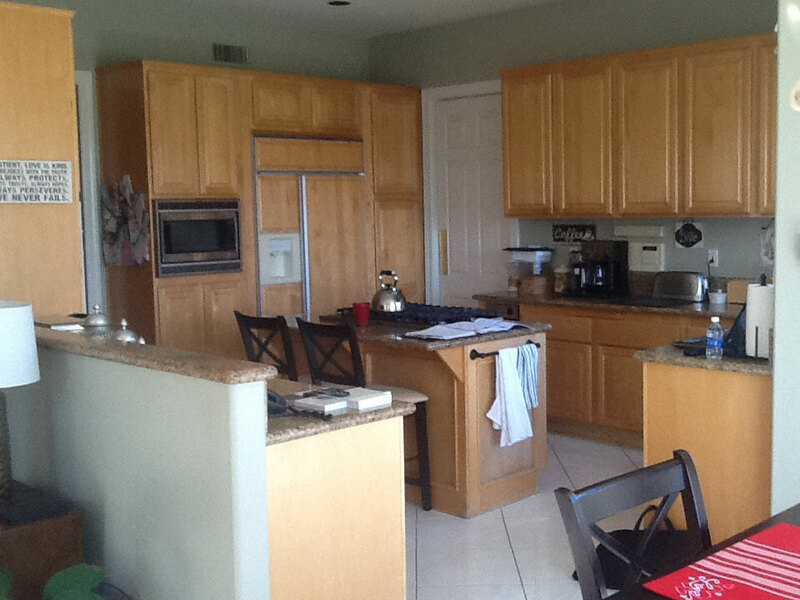 We worked to completely change the layout and footprint of the kitchen, adding more usable space and a better sense of flow and openness from the kitchen to the living area, which we also redesigned. 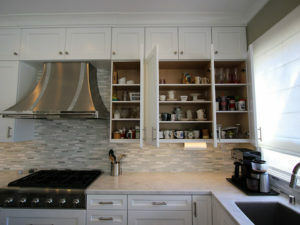 We placed the majority of the cabinetry, storage and also the cooktop and custom stainless steel wall-mounted range hood against the back wall of the kitchen, and created a more expansive bar where the once unusable pony wall was positioned. Along with a more seamless transition, this also created more seating and entertaining space. The entire design centers around a larger, custom island, featuring hand-crafted posts and a contrasting gray color palette. 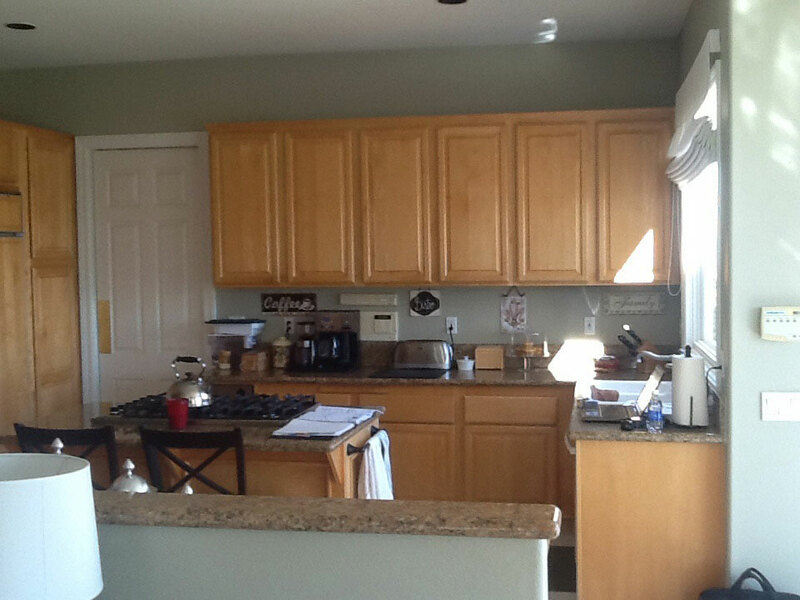 The cabinets extend to the ceiling and are highlighted by the presence of custom moldings. 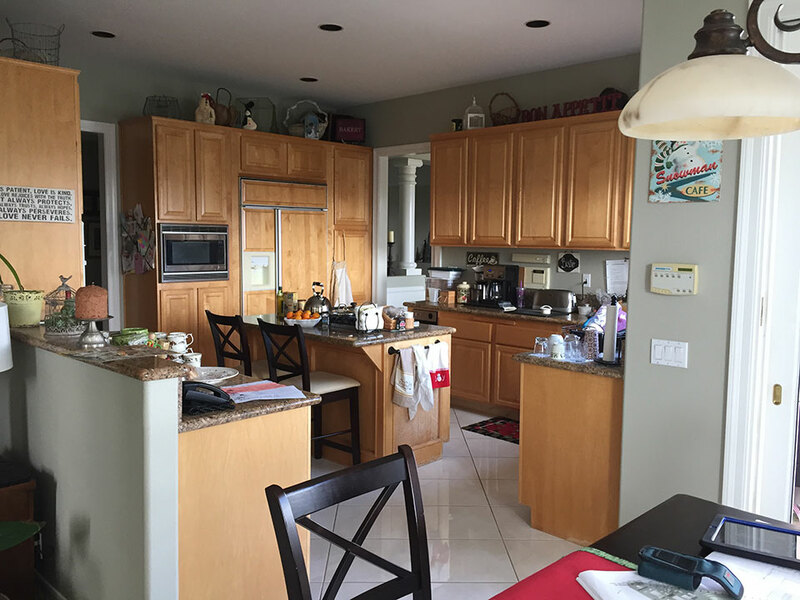 To add more creative and streamlined storage space, the APlus design team created not only standard upper cabinets but added a layer of smaller cabinets above them. 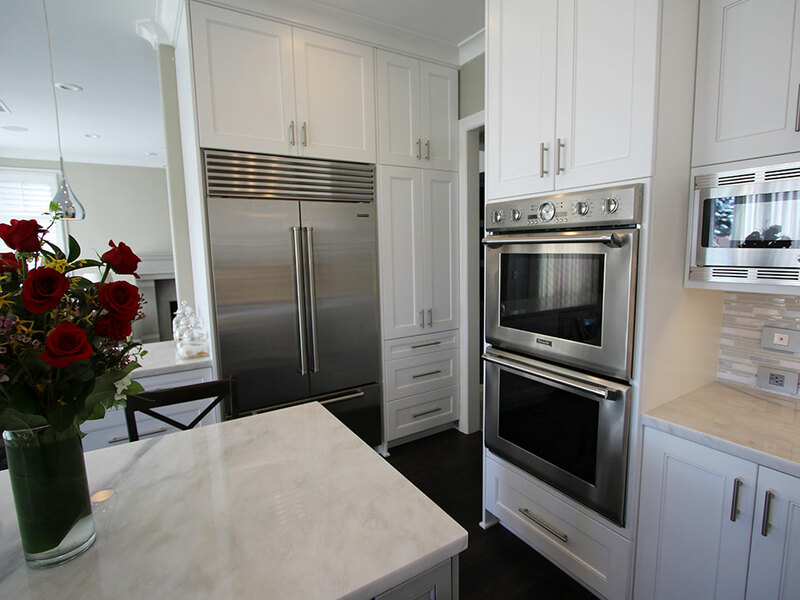 The custom cabinetry, which was designed and built by the APlus team, features a 3-inch Shaker door frame with a European construction and soft close features. Custom integrations in this Laguna Nigel remodel project include two included lazy Susans, a hidden trash pull, a spice pull and a vertical tray divider located above the refrigerator cabinet. 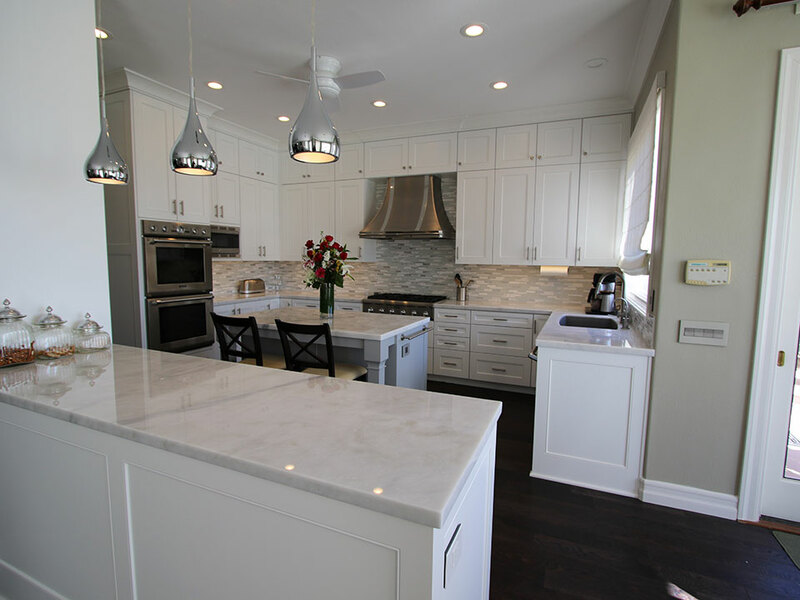 The beautiful, light-colored granite countertop boasts the clean lines of a 1 ½-inch miter edge and is accentuated by the presence of a mosaic tile backsplash in varying shades of white and gray. The carefully-selected professional grade kitchen appliances include not only the stunning range hood, but also built-in warming drawers, a 36-inch Thermador cooktop, and a Sub-Zero refrigerator. An expansive window sits above the kitchen sink, which is conveniently placed alongside the dishwasher. The dark, espresso plank flooring is a sophisticated addition and adds a feeling of drama to the otherwise crisp, white kitchen design. 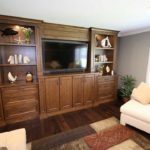 The perfect touch for entertaining is the 24-inch built-in beverage center, which holds up to 16 wine bottles and includes state-of-the-art technology like a passive cooling system and digital touch-pad controls. 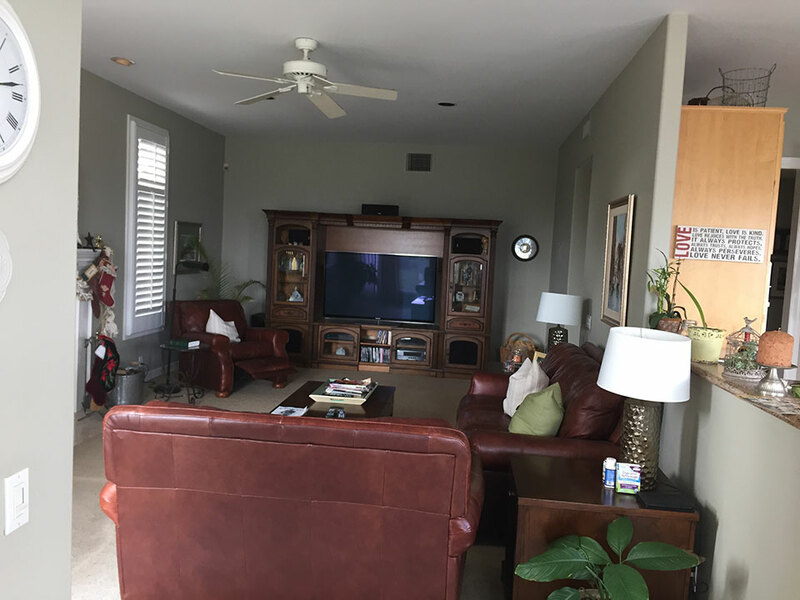 The flooring carries on to the living area, where our focus was on creating a chic custom entertainment center with display shelving, hidden storage and a central location to house a flat-screen TV. This beautiful entertainment module is the focal point of the living area and serves as not only an aesthetically appealing element but also a functional one. As part of this comprehensive remodel we updated the powder room with an elegant pedestal sink and a custom vanity-inspired cabinet, again featuring 3-inch shaker door frames, this time in a shade of gray. The laundry room was another area we worked to recreate along with the homeowners. 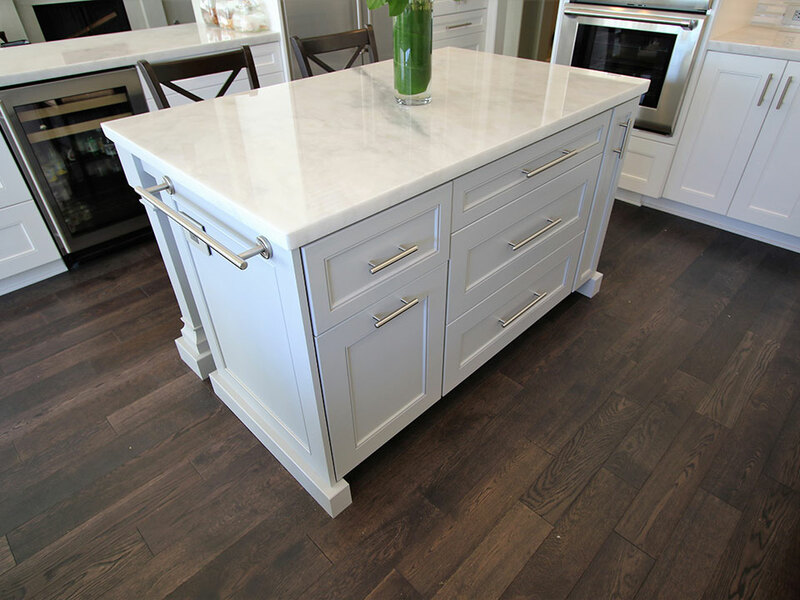 Here there is an abundance of storage in the form of custom Shaker cabinetry and lower drawers, as well as a vast countertop space for folding and other tasks. The laundry machines are tucked away in custom nooks, and there is additional storage located above them as well, ensuring every inch of available space is maximized. The look is completed with a modern subway tile backsplash and a deep farmhouse-style sink. 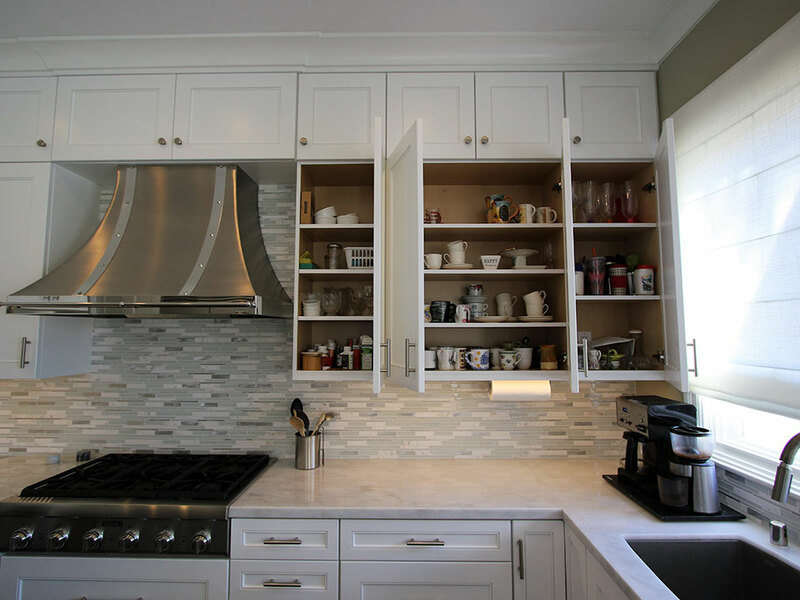 Finally, the last part of this remodel was the inclusion of a convenient butler’s pantry with gray Shaker cabinetry, including some glass-front cabinets, perfect for displays. 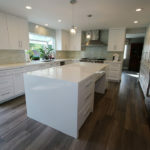 Double levels of custom pantry cabinets were added, and there’s the continuation of the natural stone countertop found in the central area of the kitchen. Tile floors and a stacked stone backsplash add depth and texture.